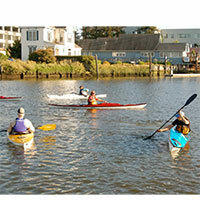 Intro to Kayaking - Make this the year you learn how to kayak! This introductory instructional kayak class will cover equipment overview, safety skills, weather conditions and basic paddling strokes all at an easy going and fun pace. This class starts out at the Clavey Paddlesports Store for the morning and moves down to the Petaluma River in the afternoon. Intro To Kayaking can be followed with Sea Kayaking I to further your kayaking skills, or an individualized private lesson. Date: Choose from date above. Location: Petaluma CA - Clavey Paddlesports & the Petaluma River. Scott Terriberry has been a sea kayak guide for 17 years working the waters from Alaska and British Columbia to Baja Mexico. He is A.C.A. trained, W.F.R certified and has taught many classes from beginners to advanced expedition paddlers. He has taught college courses in the San Juans, Tide and Current classes at the Golden Gate, and expedition travel in Mexico and British Columbia. 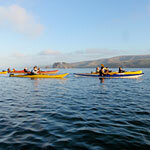 Scott is one of the founders of Point Reyes Outdoors, a sea kayak touring company in Point Reyes Station. Space is limited to 8 so sign up early. Space is not reserved until paid in full. If you find it necessary to change the date of your trip or tour, a $10.00 fee will be charged. Your space is not confirmed until we have received payment in full. We cannot make refunds for cancellations made within 2 weeks of the class/tour. We encourage you to find a friend or family member to take your place. If you must cancel within two weeks of your class/tour, we will apply your credit to another class/tour. cancellations made within 24 hours of the trip. You will be asked to sign an assumption of risk and liability release prior to participating in any class or tour. participants may not join a class or tour without a signed form. conditions out of our control. In this case, we do our best to provide you with another suitable date, issue a credit or refund. Pre-registration is required for all classes/tours. We can take a reservation up to 4:00 PM the day before the class/tour. Unfortunately, we usually cannot accommodate reservations the morning of the class/tour. If you would like to make a reservation the day before the class/tour after 4pm please call us at 707-766-8070 to check if space is available. From Barbara Wood of Oakland, California on 8/3/2018 . From Judith Arrow of Petaluma, California on 7/29/2018 . From Kathleen of Santa Rosa, California on 7/11/2017 . From Anonymous of Petaluma, California on 6/27/2014 . From Anonymous of Napa, California on 6/23/2014 . 8/30/2012 – Does this class include sit on top kayaks? I am not able to sit inside a kayak. Thanks. 8/15/2012 – Is equipment included in the class price? 7/30/2012 – What is the age minimum for the beginning kayaking class? 7/15/2012 – I have kayaked before but never have any formal lessons. I'm interested in learning some basics but most concerned with knowing . . .
6/13/2012 – Hi, I'd like to enroll together with my kids (age 10, 8 & 5) Can you tell me what is a minimum age so that I know which kids . . .